Wind gods smiled again, after tide gods let us down. Tide way out this morning, leaving 1 boat a good couple of hundred metres out of the water. A group of seafarers went from boat to boat lifting (and dragging in Black Pearl's case) most of the small boats back into the water. Even the safety boat Njord was high and dry, and was refloated by 20 or so willing helpers. 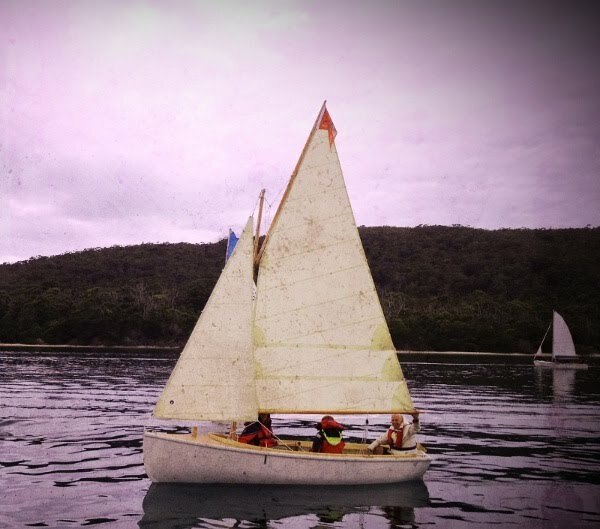 We all sailed to Butlers beach (point on end of Bruny) for a rendezvous, whilst Yukon weighed and set sail. She is such a fine sight under sail. The fleet set off again for Port Esperance with a light following breeze - excellent conditions to crosss the channel in safety and comfort. The rowers made good time. Entering Port Esperance is a mass of fish farms. With a continuing good following breeze we were able to sail right up to the landing jetty of Far South camp. Once all the fleet was bedded down, an excellent dinner was prepared by the cooks in an actual kitchen this time, and todays award went to safety boat 1 for being marooned this morning - Glynn Shevels. The day was finished off around a campfire on the waters edge under a clear starry night - another great day on the raid.